Winner of countless art show awards, the wildlife paintings of Peter R. Gerbert provide realistic and unusual views of the untamed lives of animals and birds. All of Peter’s unique acrylic paintings are based on experiences gained by exploring the great outdoors, studying wildlife in remote wilderness areas. He is always particular about all aspects of the subject’s environment, including the time of year, animal relationships and indigenous plant life.  Each new painting begins with the research material the artist has collected…and a very vivid imagination! Compositions are worked and reworked until the artist achieves a design that he is sure will be extraordinary. The actual painting is a layered process, working with texture, washes and then thicker layers of acrylics in order to achieve three-dimensional depth and realism. In addition to his many other achievements, Mr. Gerbert was commissioned for the painting “Roseate Sunset” for the Inn at Disney’s Celebration. The artist has also been commissioned three times by Bits & Pieces, Inc. for original paintings that were produced by the company as jigsaw puzzles and marketed internationally. Peter’s original painting “Scenic Overlap Ahead” was included as part of the Wild Wings, Brilliant Birds exhibit at the Tampa Museum of Art. Since 1997, the Florida Wildlife Federation has proudly featured and promoted the artist. Many wildlife art prints by Mr. Gerbert receive endorsement by the FWF and are marketed throughout Florida with part of the proceeds benefiting wildlife conservation programs. In a joint effort with the FWF and the National Wildlife Federation, 600 of the artist’s “Life in the Everglades” posters were shipped to the United States Congress in autumn of 2000 to encourage Congress to pass the important new Everglades Restoration Bill. The bill passed the U.S. Congress overwhelmingly and ultimately was signed into law by the President. In 2007, Peter received a very special Conservation Award from the FWF at the 70th Annual Conservation Awards Banquet for his accurate Florida depictions and his dedication to protecting Florida’s delicate environment. Recently he was honored with a FWF Life & Eagle Club Membership Award for his twenty years of partnership with the Federation. In 2010, Peter R. Gerbert received a very special WILDLIFE ARTWORK OF THE YEAR AWARD from Audubon Florida for his painting “The Spoonbill Lagoon.” This was the first time the Audubon group recognized any artist with this distinction and the art made the cover of the Florida Naturalist 2010–2011 magazine. In 2013, the artist’s painting “Just One Moment in Eternity” was featured on a Florida Naturalist cover. In 2017, the artist’s painting “Somewhere a Peaceable Kingdom” was the cover of the Audubon Corkscrew Swamp Sanctuary’s annual magazine. A portion of the proceeds from Mr. Gerbert’s limited prints featured by Audubon Florida have benefited the group’s ever expanding conservation efforts. 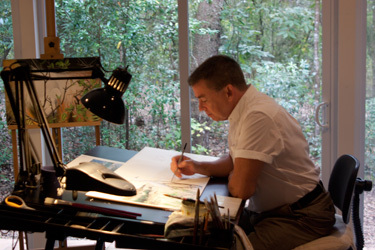 When Peter is not exploring Florida’s wilderness, he can be found creating original works of art in his art studio near a pristine oak forest in Hernando County, Florida. Native Florida has been the main focus of my work since 1993, acrylic paintings capturing wildlife and wildlife habitats with realistic detail and unique concepts. I bring many elements into my work including: direction of light and shadow, the time of year, and the flora and fauna of the particular habitat that I am portraying. All works are based on experience out in the field with my extensive research: boating, camping out and exploring remote wilderness areas to get a real feel for my surroundings and to study wild animals and birds. Going by my photography, pencil sketches and imagination, I work and rework different designs until I come up with a composition that I think will be intriguing and pleasing to the eye. With a lifelong flair for being very creative, I always try to come up with images that have never been done before. My latest works are done on custom pieces of Ampersand Gessobord. The actual painting is a layered process utilizing a technique that I have developed over the years, applying molding paste and Gesso and then adding many layers of acrylics. The texture helps to build realistic details and contrast. Given my extensive research in the field and creative design composition, each painting takes one to three months to complete. Featured artist of the FLORIDA WILDLIFE FEDERATION since 1997. A series of limited edition prints and wildlife art products by Mr. Gerbert are being marketed throughout Florida, with a percentage of all sales directly benefiting wildlife conservation efforts in Florida. October 23rd, 2010 Peter R. Gerbert receives a very special WILDLIFE ARTWORK OF THE YEAR AWARD from the AUDUBON FLORIDA for his latest painting “The Spoonbill Lagoon.” This is the first time Florida Audubon recognizes any artist with this distinction. Prints of the painting are now being marketed exclusively through Audubon, with a portion of the proceeds benefiting the group’s conservation efforts including roseate spoonbill research projects. Peter R. Gerbert's "The Spoonbill Lagoon" is featured on the cover of the FLORIDA AUDUBON NATURALIST magazine. Peter R. Gerbert's "Just One Moment in Eternity" is featured on the cover of the FLORIDA AUDUBON NATURALIST magazine. 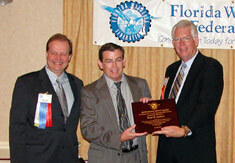 Granted a very special conservation award from the Florida Wildlife Federation during their 70th Annual Conservation Awards Banquet & Benefit on the evening of June 23rd, 2007. A beautiful, personally-engraved, wood plate declaring Peter's ten years of being the FWF’s Featured Artist along with his dedication to protecting Florida’s delicate environment. In a joint effort with the Florida Wildlife Federation and the National Wildlife Federation, 600 “Life in the Everglades” posters were shipped to Congress in the fall of 2000 to help convince Congressmen of the importance of the new Everglades restoration bill. Every member was given this vividly detailed piece of artwork to keep for their own. The bill was passed unanimously. Osceola County Board of County Commissioners purchase of the original acrylic painting “Journey Into Twilight” featuring Florida White-Tail Deer following the edge of a river at twilight, and the Fine Art Print “In the Presence of Sandhill Cranes” for the new county courthouse building in Kissimmee, Florida. Commissioned in 1998 for the original painting “Roseate Sunset” depicting roseate spoonbills in their natural environment; now on permanent display in the lobby of the Inn at Disney's Celebration, in Celebration, Florida. Commissioned three times by Bits & Pieces, Inc. for the original paintings “Life in the Everglades,” “Butterflies of the World” and “Exotic Birds of the World,” all three works produced by the company as 1,000 and 1,500 piece jigsaw puzzles and marketed internationally, with over one-million catalogues per mailing. Commissioned by Catholic Charities Diocese of St. Petersburg for the original painting “Communion with the Son,” reproduced as posters commemorating the Jubilee Year and RENEW 2000. Artwork included in “Nature Kits” mailed out to all Florida Public Schools by the National Wildlife Federation. Limited Edition Prints offered by the Florida Fish and Wildlife Conservation Commission as a fundraiser for the “WILD Action Grant” Fund for Florida’s Schoolyard Habitat’s. Four paintings chosen as “patch designs” by the Boy Scouts of America, patches currently in production. Artwork featured in newsletters for Southwest Florida Water Management. Featured artist on the website of CloudEight Stationery, with artwork used as Microsoft Outlook stationery. CloudEight Stationery has been rated as one of the top one-hundred website's in the world with over ten-thousand visitors per day. Sample Peter R. Gerbert Outlook Stationery included on Microsoft’s Outlook Training CD-ROM. 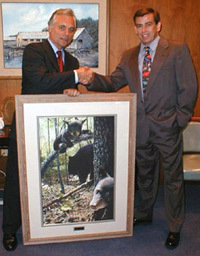 In August 2001, a framed “Bear Trees” Fine Art Print is presented to Florida's Attorney General Bob Butterworth on behalf of the Florida Wildlife Federation; a token of appreciation for Mr. Butterworth's outstanding efforts to help protect Florida's fragile wilderness and unique wildlife. The artwork was displayed in Mr. Butterworth's office inside the Florida Capitol Building. Wild Wings, Brilliant Birds exhibit at the Tampa Museum of Art, September 6th, 1998 to January 10th, 1999. Approximately twenty art shows per year including Mt Dora Fine Arts Festival, ArtiGras in Jupiter, Santa Fe Community College Spring Arts Festival in Gainesville, Hernando County Art Festival in Brooksville, Cool Art Show in St. Petersburg, Space Coast Art Festival in Cocoa Beach and many others. Limited Edition Prints are currently being displayed and sold in over one-hundred art galleries and frame shops throughout Florida. Peter R. Gerbert's "The Spoonbill Lagoon" is featured on the cover of the AUDUBON FLORIDA NATURALIST magazine. Peter R. Gerbert's "Just One Moment in Eternity" is featured on the cover of the AUDUBON FLORIDA NATURALIST magazine. Artwork featured in almost every issue of Florida Fish and Wildlife News since 1997. 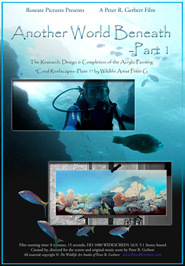 Make sure your speakers are cranked up, and dive into the complete creation process of "Coral Reefscapes -Plate 1" in the new short film "Another World Beneath -Part 1"
...on the movies page of this website!